First: What is your reaction when you see businesses that score like these on Google? c) 'Feel sorry that the image of the business may have been unfairly tarnished by a tiny minority of highly-motivated dissatisfied customers'? 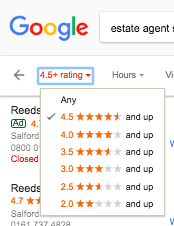 Second: do you use the Google filter when searching for businesses? *We use the word 'heard' here advisedly - you will have 'seen' the filter but may not have 'noticed' it or been conscious of it. Google introduced it into map search first and then, when it proved popular (Google never do anything by accident) they migrated it to mobile - where over 70% of searches now take place. This means that savvy searchers are now filtering any business that scores less then 4.5 out of their searches completely. There's more on the Google filter here. Anyone who has answered 'b' to both these questions is probably so cynical they will be impossible to convince that reviews, Google or otherwise, matter at all. For the rest of us - and academic research suggests we are in the overwhelming majority - let's proceed to the next step. **Important note (1): there are currently many businesses that think they have a viable solution to Google reviews: they simply hand-pick customers they they have a very good reason to think will post a five star review. This is, for reasons which I am sure you will appreciate after some thought, against the law in the UK. It also runs the risk of the business being sanctioned by Google for what they call 'gating'. For more on the UK government regulations relating to this, please read this article. At HelpHound we are - self-evidently - only interested in helping businesses that fall fairly-and-squarely into the second category. Why? Because our service only works for businesses in that category - we cannot (and would not) work to enable a shoddy business to look good. ...and read the full story here. 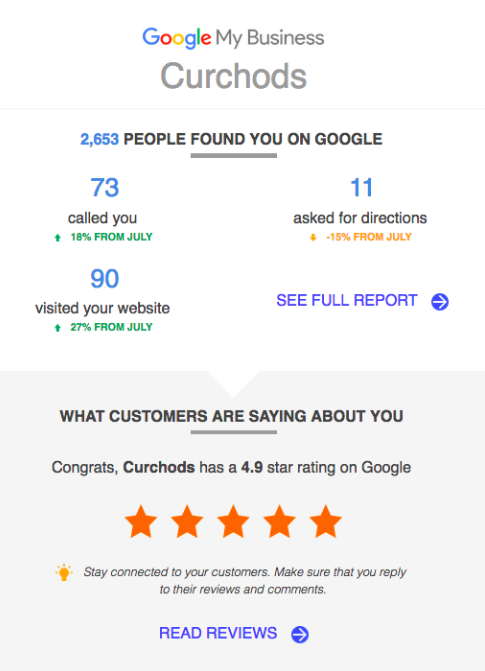 ...but you won't need to wait six months to see the benefits - the Google My Business report for Curchods you see above was sent to them within weeks of joining (and they had started from scratch). Everything we advise you to do will be in compliance with the CMA regulations. Everything we advise you to do will be 'best advice' for your business - no one-size-fits-all widgets, just pure professional advice. These sites - certainly for high-value professional and transactional service businesses - have been dealt a death-blow by Google. 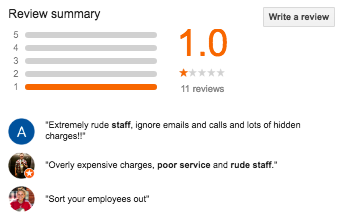 Since Google reviews became the vehicle of choice for those wanting to 'get back' at businesses that they see - rightly or wrongly - have done them a disservice, we have noticed a very common, and harmful, syndrome that has now reached epidemic proportions: it's called 'deflection' and it means that happy customers are writing to the business's reviews site of choice and unhappy customers are writing to Google, meaning that the business looks much worse than it should on Google. If you suspect that your business has fallen - or may fall - victim to this, please read this article carefully. Like any other professional adviser, we stand or fall on the value of our ongoing service to you, our client - so we don't tie you into any kind of contract. 'Yelp! is over' - really?